Although martial arts have been around for thousands of years... the rise of interest over the last decade is absolutely undeniable. You can hardly navigate through Calgary nowadays without seeing a new MMA Gym or billboard. It is even more difficult to go a day without seeing martial arts video clips or photos on your social media. Much of this can be attributed to the increase in popularity of certain fighting organizations like the UFC but it may also be that with how much our daily lives are spent sitting in this computer-based world... we're searching for something physical that's truly fulfilling to both our bodies and minds. "Is Kung Fu A Martial Art?" The definition of Kung Fu is "Skill and Art" or "Excellence Through Training" which could technically be applied to anything in your life. If you put your all into doing the task at hand... if you focus very hard and put passion into your craft... you are doing Kung Fu. 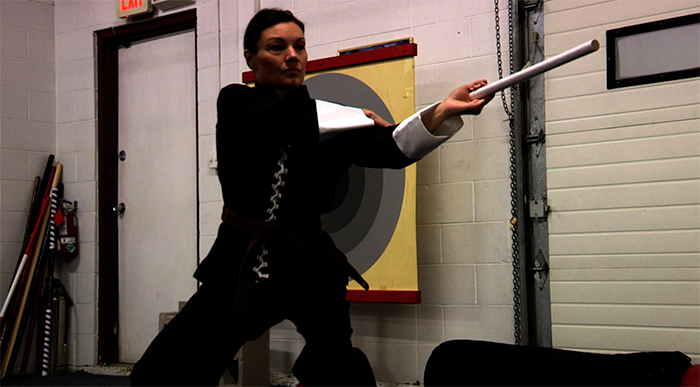 What we train here in our studio is called Wushu which means military/martial. Depending on who translates Wushu Kung Fu it can mean "Combat Kung Fu" or even "Martial Art Form". What does all of that mean? It means that yes, here at Kung Fu For Life in Calgary, we are definitely helping you to become trained in a martial art. "Is Kung Fu Used In MMA?" When you think of martial arts today you may be thinking of Mixed Martial Arts (MMA) which has been popularized in the media by the UFC and the reality show The Ultimate Fighter. Although they used to pit many kinds of martial arts against one another (Judo vs Karate or Tae Kwon-Do vs Kung Fu or Boxing vs Wresting etc.) they have now moved into a more specialized arena seemingly focused mainly on Kickboxing and Brazilian Jiu-Jitsu (BJJ). Most of the traditional martial art forms seem to have - by either accident or design - been flushed out. "What Do Martial Arts Do For You?" What martial arts is for us is the ability to defend yourself at first and then an understanding of what techniques would best be effective against the most common attacks that may be encountered in daily life. After that has been covered then we begin to perfect techniques against the lesser common attacks, then the more violent attacks, then we advance to learning how to handle attackers of different sizes, strengths, and numbers. In addition to these very important skills you will also become able to defend against the use of weapons and know how best to react in life or death situations. After you are completely confident in the self defense is when the art side of Kung Fu comes in and you are not just going to be able to defeat an opponent... but you'll be able to do so with ease and then with less and less effort until it becomes second-nature. You'll get to a point where you'll be capable of defeating multiple attackers by gently tossing one opponent into the others and disabling them. Defending with style and grace without hurting yourself or even hurting them too much if you choose not to. It is a form of self-expression and self-exercise that engages the mind in a way you might not initially realize. The martial art of Kung Fu gives you a second set of eyes with which to perceive the environment around you in a new and meaningful way. It can help you stay calm and you can get the mental benefits and be able to command others in a way that doesn't even seem like you are commanding them and move things into a peaceful resolution to win without throwing a single shot.